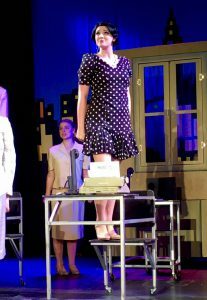 From the moment Millie Dillmount (Rachel Miller) appears on stage, bright-eyed and full of hope, in front of a New York City skyline and starts to sing, there is no doubt that the audience is in for a treat. From beginning to end, the cast of Thoroughly Modern Millie Jr. at Children’s Playhouse of Maryland, Directed by Liz Boyer Hunnicutt, with Music Direction by Charlotte Evans, and Choreography by Amanda Poxon, never fails to delight and to demonstrate that young people are incredibly capable of stunning vocals, intricate dance routines, and nuanced, mature acting performances. The entire ensemble of young people does an amazing job of bringing this fun and funny musical to life. Setting the stage (literally) for their success are Diane Smith’s set design and Laura Miller’s scenic art. A combination of projection and cleverly-designed set pieces lead to seamless transition between a variety of locations. Coupled with a beautiful light design at the hands of Ed Lake, the audience is transported to the various locations, including a window ledge over the city. The total transformation of the actors to another place and time is completed with careful costume design by Sharon Byrd. Of course, all of the set and costumes truly sizzle to life due to the brilliant direction of the creative team. Hunnicutt, Evans, and Poxon don’t back away from challenging the young performers to push themselves and have clearly prepared them well to be ready for the leap. The scenes shows careful comedic timing and character work; the music comes to life with solid and consistent harmonies; and the dance is just “WOW.” Poxon clearly has a gift. From flappers to tappers, every big dance number is unique and creative and the entire cast falls into lockstep with each other. These three ladies truly provided the foundation that allows these young performers to shine. From small roles to large, shine is exactly what they do. From the very first dance number, the ensemble makes their mark. Front and center in that first number and standing out with her boundless energy and infectious smile is Evelyn Acerno. The ensemble continues to impress in a variety of roles as stenographers, boarding house residents, and other New Yorkers. Two other young ladies that really stand out in every ensemble scene and number are Ava Corelli and Angela Boeren. At every moment, they are selling the choreography and reacting appropriately in character. Speaking of characters, this show is full of them! Sophia Possidente (Miss Flannery) is an absolute hoot. She creates a zany character who still comes across as real. Her comic reactions to the lines of others are also well-timed and sophisticated. Also showing just the right mix of crazy and restrained are the hilarious performances of Matthew Byrd and Allison Naglieri as Ching Ho and Bun Foo. Byrd was especially endearing in his quest for love. The pair also had excellent comic banter with Mrs. Meers (Emily Ricci). Ricci has a commanding presence on stage and delivered a stellar performance. In the role of Miss Dorothy, Heidi Thiessen was the perfect ingénue. She exudes natural innocence. Will Foohey (Jimmy Smith) and Matthew Trulli (Trevor Graydon) both brought a warmth and natural likeability to the two male leads. Trulli was especially entertaining in the scene after being stood up at a restaurant, and Foohey did a solid job of showing Jimmy’s growth throughout the show. That trio especially excelled when they were singing. Each of them had a beautiful tone quality and evident vocal training. Those three voices, combined with that of Millie herself, in “I Turned a Corner” created an especially touching musical moment. 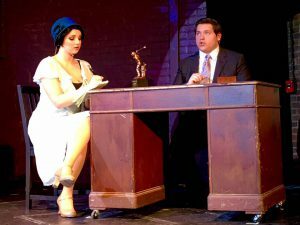 As wonderful as every aspect of this production was, it would be nothing without the perfect Millie – and that’s exactly what they had in Rachel Miller. Miller was the perfect balance of sweet and stubborn. She created a character who came alive in the cracks between her contradictions. A clearly capable dancer, she led and commanded the big dance scenes. Miller also has a beautiful belt but also this throaty quality to her voice that makes it both reminiscent of other famous stage belts and yet also uniquely her own. She wore the vocal score and the role like a glove, as if it had been written especially for her. This production proves yet again that there is nothing “just” about children’s theatre. Everything about this production was delightful, and it could easily compete with any adult production in the area. Go see Thoroughly Modern Millie Jr. at Children’s Playhouse of Maryland, and you will not be disappointed! 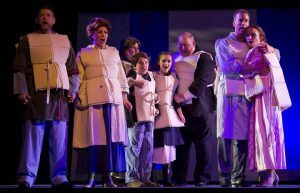 This is what I thought of Children’s Playhouse of Maryland’s production of Thoroughly Modern Millie Jr… what did you think? Please feel free to leave a comment! 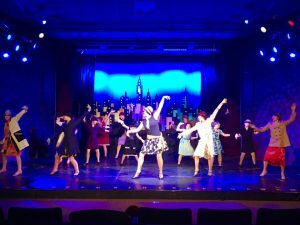 Thoroughly Modern Millie Jr. will play through December 16 at Children’s Playhouse of Maryland, at The Community College of Baltimore County, Administration Building, 7201 Rossville Boulevard, Baltimore, MD. For tickets, call 410-443-ARTS (2787) or purchase them online. Throughout our human history, many tragedies have struck us unawares but some stand out more than others and become legendary. This is just the case with the RMS Titanic in April of 1912. In 1997, the tragedy was brought back to the forefront of the world psyche with James Cameron’s film, Titanic, that mixed history, historical speculation, and fiction to produce one of the bestselling US films to date earning fourteen Academy Awards and garnering eleven of them. Some may know that same year, about 8 months prior, Broadway opened its own version of the story that swept the Tony Awards, earning five Tony nominations and winning all of them! Titanic the Musical with Music & Lyrics by Maury Yeston and Story and Book by Peter Stone is Scottfield Theatre Company’s latest offering. This production is Directed by Al Herlinger with Music Direction by Niki Tart and Rick Hauf and Choreography by Becky Titelman. This version of the story of the ill-fated Titanic is also a mix of historical fact and fiction with many subplots of created characters mixed in with portrayals of actual people who were sailing on the ship. Cameos of the most famous and influential people pop up throughout the production including J.J. Astor, Benjamin Guggenheim, Captain Smith and Crew, and White Star Lines associates Thomas Andrews and J. Bruce Ismay. Curiously, my favorite passenger is omitted from this piece and the notably brash and unsinkable Margaret “Molly’ Brown is nowhere to be found, but I suppose that’s another show in itself. But I digress… sometimes a story can look good on the screen but that doesn’t necessarily mean it’ll work on the stage and Titanic the Musical might fall in that category. It certainly has its flaws such as the music and lyrics tending to get hokey at times and there are too many subplots going on in a couple of hours, but, if carefully presented, the pros outweigh the cons and this is a show that can turn into a commendable production. The story progresses through the maiden voyage of the ship and the goings on throughout each deck, concentrating on class which, for some, was all the difference between life and death in this tale set toward the end of the Gilded Age and entering the Progressive Age. Scenic Design by Bob Denton is minimal, but this is a wise choice as there’s only so much one can do with a ship setting, but he does use moving flats cleverly and the opening scene, a sunken Titanic that transforms into a brand new ship on her maiden voyage is impressive. Picking up Costume Design duties is Elizabeth Marion and her design is impeccable. Her attention to detail is impressive as there is a certain distinction between the classes on board and each character is individual which is no small feat when it comes to a period piece of theatre. Marion is to be commended on her Costume Design efforts. Choreography by Becky Titelman, a co-founder of the company, is minimal as well, but that’s only because this is a ballad driven show with only a few chances for any complex choreography, but in those few moments, Titelman’s choreography is admirable and energized. She seems to know her cast and instead of hindering their talents, her choreography allows them to shine. This is a music heavy show where the score takes the lead and Music Direction by Niki Tart and Rick Haugh is praiseworthy. I will say some of the songs are trite with hokey lyrics, having the cast sing through scenes that probably work better as a dramatic scene rather than a musical number, but Tart and Hauf have the cast harmonizing and have handled this heavy score quite well. The orchestra, Directed by Hauf, consists of members Enid McClure, Margaret McClure, Andrew McClure, Keiko Myers, Maddie Clifton, and Dan Vaughan and bring the notes on the page to life in a full, lush sound that accompanies this ensemble beautifully. Allan Herlinger, a co-founder of Scottfield Theatre Company, stands at the helm of this production and his comprehension of the material is clear and the first act is a series of vignettes concerning the different characters on board and Herlinger emphasizes this to a slight fault, presenting each vignette almost separately breaking up the flow and pacing of the piece. Instead of melding one scene into the next, there are slight breaks and slow the production down a bit. That’s not to say the pacing is off, because it certainly is not. The production still moves along nicely, but could move along better without the slight breaks between the scenes. SPOILER ALERT (if you don’t know the story of the Titanic already) One flaw that stood out for me is the portrayal of the moment the Titanic encounters the ice berg that would seal its fate. 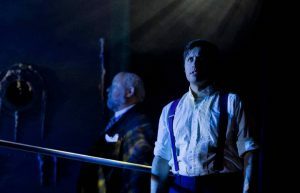 Jess Hutchinson, as Frederick Fleet does an admirable job throughout playing various characters, but in this fateful moment, the iconic words, “Ice berg, right ahead!” falls completely flat and the urgency and energy is lost as the second act moves on. Herlinger’s vision seems to get lost along the way, as well, throughout the second act. However, this being said, his efforts are to be applauded as it is always a challenge to take on a piece about a famous, historical event and give it a fresh presentation for a current audience, but Herlinger has done a fine job in doing so. Moving on to the performance aspect of this piece, it’s worth stating that this ensemble gives 100% effort and they all work well together. As an ensemble, they bring this poignant, tragic story together superbly and all should be commended for their work. Some of the characters are important crew members including Sam Ranocchia as Henry Etches, a 1st class valet. Ranocchia is confident in his role but there were times when he seems to take it over the top and the performance becomes stiff. He’s doesn’t give the strongest vocal performance, but he does portray the character quite well. He seems to embody this 1st class valet and makes the most of this time on stage. Two characters that actually keep the ship running are 1st Officer William Murdoch, played by Scott Kukuck and Frederick Barrett, a stoker in the bowels of the ship, played by Charlie Johnson. These two gentlemen have a good comprehension of their character but, unfortunately, their performances fall a little flat. They do an admirable job, but they are both missing a subtle energy that is required of these characters. Johnson takes a “plant and sing” style of portrayal and there are times when Kukuch’s performance seems forced and unnatural, especially the moment his character is at the wheel of Titanci during the collision. Vocally, Charlie Johnson is a powerhouse with a strong tenor that rings throughout the theater and that does make up for the lack of enthusiasm in his portrayal. Along those lines, Scott Kukuch has a confident presence on the stage and is comfortable in his role. 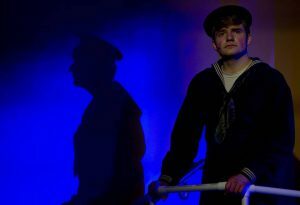 Wireless operator Harold Bride is portrayed by Matthew Tulli and he does an impressive job working with what looks like an actual wireless machine and his featured number “The Proposal/The Night Was Alive,” is performed well, with lots of emotion. Lisa Rigsby and Donovan Murray tackle the roles of Caroline Neville and Charles Clarke, two secret lovers running away to a fresh start and their characters are important because, historically, many people started new lives in this way – traveling across the ocean and simply starting over. Rigsby and Murray give tender and authentic performances and embody the many folks who were on Titanic, heading for a better life for themselves. They’re poignant moment during “We’ll Meet Tomorrow” is memorable and tugs at the heart, which is exactly what it should do. 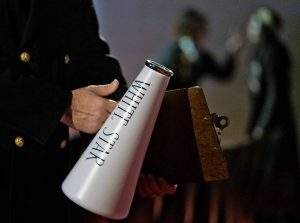 Taking on roles of the powers that be on Titanic, Phil Hansel portrays Captain Smith and Matthew Tart takes on the role of J. Bruce Ismay, President of the White Star Line. Both of these gentlemen give superb performances as these two characters. Hansel not only resembles the real Captain Smith, but carries himself like a leader and gives a natural portrayal. Playing J. Bruce Ismay is a challenge for any actor as this character is seen as the antagonist or villain, whether it’s warranted or not, but Tart plays this character as walking a very fine line between progress and the safety of the passengers. He’s absolutely believable as this character and gives a strong performance. A couple of highlights in this particular production are Wayne Ivusich and Pamela Provins as Isador and Ida Strauss. Their story is famous as witnesses state that Ida Strauss wouldn’t leave her husband’s side even though she was repeatedly offered a seat on a lifeboat. Their story is one of a lifetime love and Ivusich and Provins have a great chemistry that make their impressive portrayals authentic and natural and their duet “Still,” can easily bring a tear to your eye or cause your eyes to get watery, at least. 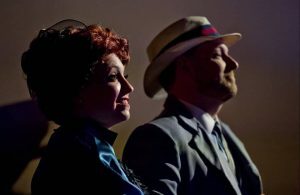 Two more highlights of this production are Brian Ruff and Elizabeth Marion as Edgar and Alice Beane, a second class married couple who are traveling mainly to ease the wanderlust of Mrs. Beane, who wants to see the world and hob-nob with the rich and famous. These two characters, who seem to be complete opposites, work well together and provide some comedy relief to a deep, heavy show. Ruff, who plays the straight man as Edgar Beane, portrays the overwhelmed but patient husband humorously but with realistic flair as he tries to reign in his wife and Marion gives an impeccable performance as the excited, yearning wife who wants more from life than any small town can give her. Marion has great comedic timing and plays the character silly enough to be funny, but serious enough to be moving. Vocally, she does a fantastic job with her featured numbers “The First Class Roster” and the poignant “I Have Danced” and both of these actors add great value to this production as a whole. Two standouts in this production are Isabella Bordner as Kate McGowan and Rob Tucker as Thomas Andrews. 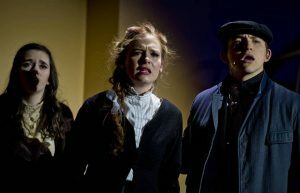 Bordner, a senior at C. Miltion Wright High School, is quite impressive as the Irish immigrant, Kate McGowan, who is trying to make it to America to start anew and this young actress has her character and accent down pat. She has a strong, confident presence and is a joy to watch and I’m looking forward to seeing more stage work from this budding actress. Rob Tucker, who is no stranger to the area stages, takes on the important role of Thomas Andrews, architect of Titanic and the one man who knew every nook, cranny, and bolt on this massive ship. Tucker completely embodies this character and portrays his perpetual worry beautifully. Vocally, Tucker is a dynamo as he belts out his featured numbers, “The Largest Floating Object in the World” and the moving and intense “Mr. Andrews Vision” flawlessly. Both Bordner and Tucker are a joy to watch and are to be commended for their efforts. 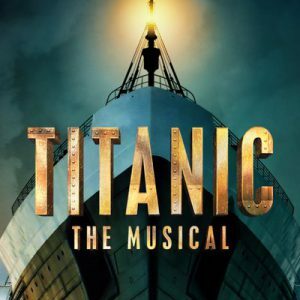 Final thought… Titanic the Musical is a poignant telling of the well-known fate of the ship they called the “Ship of Dreams” and though the music is lovely and the performances are admirable, there’s something about this show that doesn’t work. Firstly, the writers are trying to make a horrible event beautiful and, secondly, they seem to try to pack as many stories as they can into a couple of hours, jumping around from sub-plot to sub-plot, affecting the flow of the piece as a whole. As stated, the music is lovely, but there are moments when it is a bit trite and elementary and those moments take away from the soaring harmonies and more complex melodies (that the cast accomplishes quite well) that make a great show. The performance and execution of the show is quite well-done and this ensemble gives 100% effort and I want to make it clear my dislike is with the writing and composition of the show, but… they made it to Broadway, so, what do I know? It is an audience favorite so it’s definitely worth checking out whether you’re a Titanic expert or someone just discovering this legendary ship and its ill-fated journey through the ages. 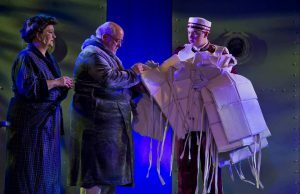 This is what I thought of Scottfield Theatre Company’s production of Titanic the Musial… What did you think? Please feel free to leave a comment! 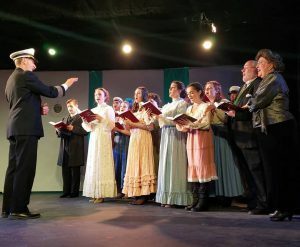 Titanic the Musial will run through April 15 at Scottfield Theatre Company, The Cultural Center at the Opera House, 121 N. Union Avenue, Havre de Grace, MD. For tickets, the box office is open one hour prior to performance but it is strongly encouraged to purchase tickets online.